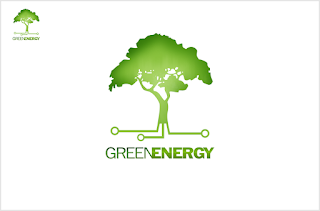 Green energy is energy that is produced in a manner that has less of a negative impact to the environment than energy sources like fossil fuels, which are often produced with harmful side effects. “Greener” types of energy that often come to mind are solar, wind, geothermal and hydro energy. 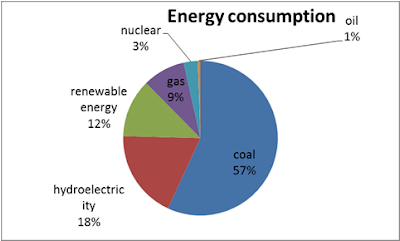 There are several more, even including nuclear energy, that is sometimes considered a green energy source because of its lower waste output relative to energy sources such as coal or oil.Green Energy is generated from alternative energy sources that get powered by various natural events and cannot get depleted with use. The three main sources of Green Energy are water, wind and solar energy. These can limit the dependence on fossil fuels dramatically. 1. The coal and oil produce of the world is not renewable. This means that in the near future we are likely to run out of these fuel sources. It takes an infinitely long time to replenish the resources. With the kind of development we are going through, this rate is also likely to fall down. 2. Since the discovery of coal the amount of harmful gases that are emitted from the exhausts and industry furnace have killed some of the important elements of our atmosphere. This is definitely not the right way to repay the atmosphere which has been acting as a blanket preventing us from a variety of harmful elements of the outer space. 3. And cost of energy in near future by conventional fuel resources continuously increase and our demand also increase sharply that make the situation more worst so we need energy which is more reliable and low in price. The consumption of energy sources are increases very fast in last 15 year specially, because of high growth rate recorded during this period. Since 1994-95 the electricity consumption increase by about four time, coal ingesting increase by two time, lignite by two time, natural gas increase by more than two time, oil product increase by three time. But the demand of energy resources still deficit of about 15 %of total production. According to ministry of power, total energy produce during the year 2012 of that total 57 % come from the coal, 18 % obtain from hydroelectric power ,3 % from nuclear energy plant produce and 1 % from oil and petroleum product and 12% energy produce from the renewable energy (wind , solar and biomass mainly). According to planning commission, after completion of eleventh plan (March 2012) the total capacity anticipated is 225029 MW in India. Of the total 50281 come from various hydro project, 7280 MW share is of nuclear power ,21760 MW come from renewable energy(majority from wind ,biomass, and solar power) and last major portion come from thermal is about 145708 MW . 1.Private sector ( e.g. TATA power, reliance India etc.) which nearly produce 62,459.24 MW of the total which is around 29.49 % of the total capacity. In Power sector lots of scope of investment from the private sector in near future. 2. Central sector: mainly involve in large project in term of money and multiple state involvement in which difficult to coordination. Central sector are simply means in which central government involve. Central sector nearly produce around 62963.63 MW which is about 29.73 % of the production which is slightly higher than private sector. 3. State sector: Largest contributor in power sector which contribute 86,343.35 MW which is about 40.77 % of the total. Renewable energy can make a substantial contribution in maintain the growth of economics for longer period. Renewable energy is no longer “alternate energy”, but increasingly becoming a vital part of the solution to the nation’s energy needs. In term of all renewable energy categories, India is currently ranked fifth in the world with 15,691.4 MW grid connected and 367.9 MW off grid renewable energy based power capacity. India is among the top five nations worldwide for solar power energy development according to Ernst & young’s renewable energy attractive index. As on march, 2012 installed capacity of renewable based power generation was 24,503 MW which is about 12 % of the total installed capacity of 199,626 MW. The major renewable energy sources (RES) are wind energy, biomass & waste energy and small-hydro energy. 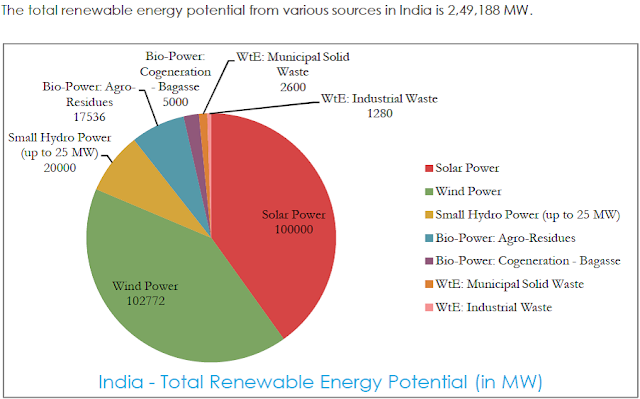 Recently government of India (2015) emphasizing the need to generate more electricity from clean energy sources, the government t announced a massive renewable power production target of 1,75,000 mw in the next seven years (2022). Of the total 1,75,000 mw proposed to be tapped by 2022, solar power will have a lion's share of 1,00,000 mw followed by 60,000 mw from wind energy, 10,000 mw biomass energy and 5,000 mw of small hydro projects. There is high potential for generation of renewable energy from various sources- wind, solar, biomass, small hydro and co generation bagasse. The total potential for renewable power generation in the country as on 31.03.14 is estimated at 249,188 MW. This includes an estimated wind power potential of 102,788 MW (41.249 %), Solar power 100,000 (40.13), SHP (small-hydro power) potential of 20,000 MW (8.03%), Biomass power potential of 17,538 MW (7.04%) and 5000 MW (2.01%) from bagasse-based cogeneration in sugar mills. 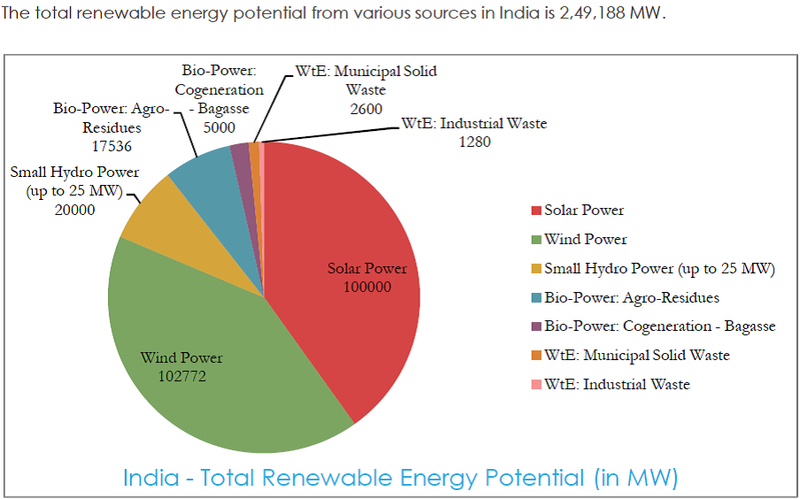 The geographic distribution of the estimated potential across States reveals that Gujarat has the highest share of about 14%, followed by Karnataka with 12% share and Maharashtra with 11% share, mainly on account of wind power potential. It is easy to recognize the environmental advantages of utilizing the alternative and green energy but we must also be aware of the disadvantages. Disadvantage of green energy sources is the reliability of supply. Renewable energy often relies on the weather for its source of power. Hydro generators need rain to fill dams to supply flowing water. Wind turbines need wind to turn the blades, and solar collectors need clear skies and sunshine to collect heat and make electricity. When these resources are unavailable so is the capacity to make energy from them. This can be unpredictable and inconsistent. The current cost of renewable energy technology is also far in excess of traditional fossil fuel generation. This is because it is a new technology and as such has extremely large capital cost. Land is a scarce resource in country like India and per capita land availability is low. Dedication of land area for exclusive installation of solar arrays might have to compete with other necessities that require land. The amount of land required for utility-scale solar power plants—currently approximately 1 km2 for every 20–60 megawatts (MW) generated could pose a strain on India's available land resource. The architecture more suitable for most of India would be a highly distributed set of individual rooftop power generation systems, all connected via a local grid. However, erecting such an infrastructure, which does not enjoy the economies of scale possible in mass, utility-scale, solar panel deployment, needs the market price of solar technology deployment to substantially decline, so that it attracts the individual and average family size household consumer. That might be possible in the future, because PV is projected to continue its current cost reductions for the next decades and be able to compete with fossil fuels. Lack of Consumer Confidence: Because these forms of technology are new, they are largely untested and consumers do not understand them. Many alternate forms of energy, such as hydrogen-powered vehicles or home-based solar power, may require a significant change in consumer behavior, which is a large leap of faith for unproven technology. Part of the reason smaller steps such as bio fuel were so easily accepted is because it was not an overlarge departure from normal behavior. Usually the wind energy turbine , SHP and other green energy site are far away from residential area so cost of transmission is quite high and some time its impractical. One disadvantage with green energy is that it is difficult to generate the quantities of electricity that are as large as those produced by traditional fossil fuel generators. This may mean that we need to reduce the amount of energy we use or simply build more energy facilities. It also indicates that the best solution to our energy problems may be to have a balance of many different power sources.